I think everybody stops to enjoy the view and take a photo on this ledge! Thanks Tiffany for this great shot. Directions: Located in the East Texas piney woods of Angelina National Forest, 70 miles North of Beaumont. From west of Jasper, Texas take TX 63 West approximately 11 miles to the intersection of Recreation Road 255. Turn right on 255 and go approximately 3-4 miles to the park entrance road on your left (there will be a sign). You will drive about 1.2 miles on the park road and you will also pass the spillway before reaching the Ebenezer Park Campgrounds on your right. Mileage: According to the park’s website there is approximately 1.5 miles of trails in Ebenezer park which opens up into the Angelina National Forest where there are 20+ miles of trails. 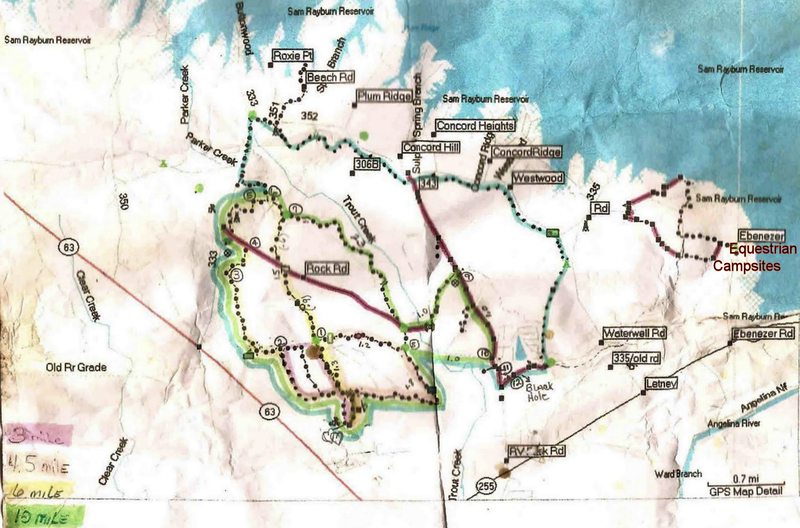 Maps: I was able to find a few rough maps of the area and trail from doing a Google search. 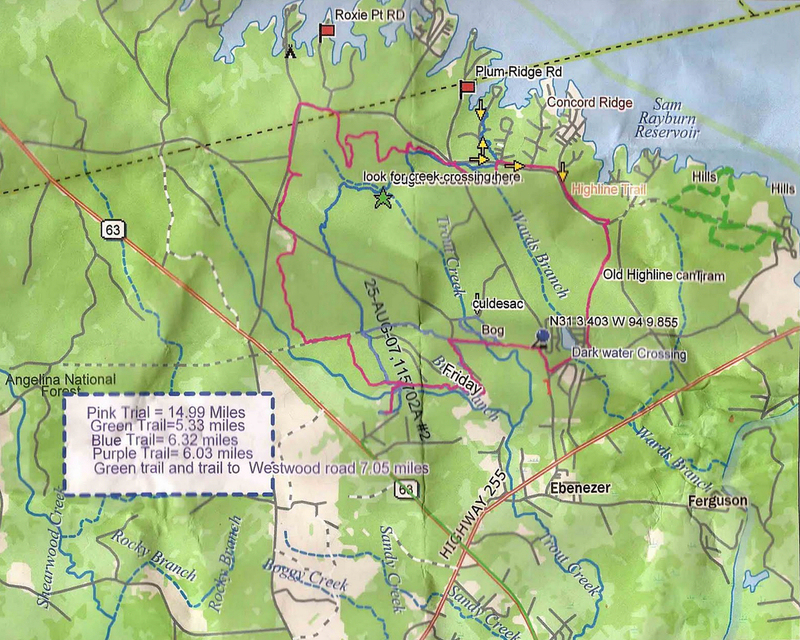 This one does not show all of the trails but gives you an idea of some of the major trails in the area. Terrain: The terrain is soft, sandy, no hoof boots/shoes needed. Some trails are easy rolling terrain, some creek crossings and gullies. There is lake beach access at a couple of different places on the trails but not at the campgrounds. Restroom and shower house at Ebenezer Park. Facilities: The camping area is next to the lake and completely shaded under the trees. There are 13 Equestrian only sites which are very well spaced out so you aren’t on top of each other. Most of the campsites don’t provide a view of the lake, however, sites 11-13 with gravel pads have a small lake view. There is plenty of room for large rigs to easily maneuver. The equestrian facilities consist of full hook ups (30 and 50 amp), a water faucet (bring your own hose and spray nozzle), paved parking pads (except sites 11 – 13 are gravel pads), most sites has a covered picnic table, all sites have fire rings/grills, two horse pens, and 2-3 tying posts. 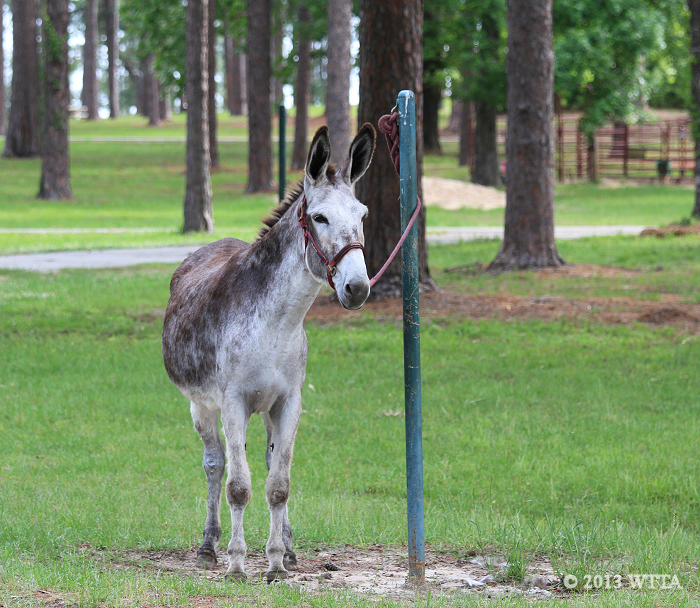 The tying posts are handy as you can tie your horse directly to the pole or picket them on a line in between the poles. Each site includes 2 large 12X24 paneled horse pens for use at NO additional charge. 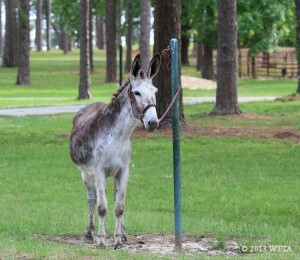 2-3 posts per site make it easy to stationary tie or picket your equine friend. You are also allowed to set up your own portable pens/corrals/pickets. However, electric pens are not allowed. 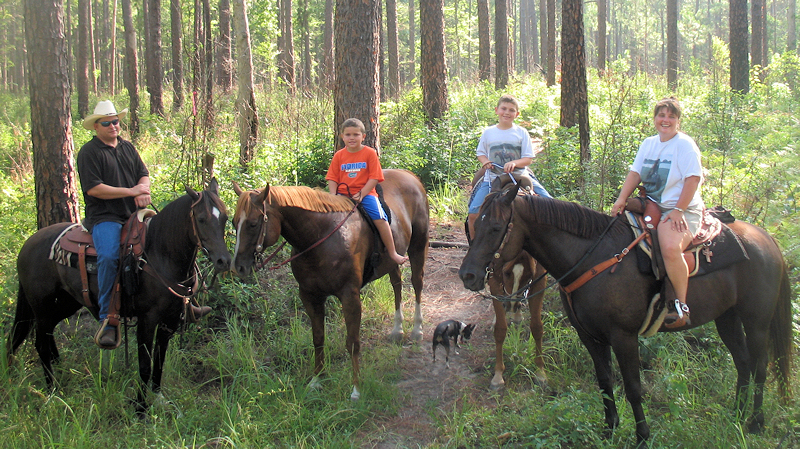 Each equestrian campsite must have at least one horse but no more than 4 horses per site. Manure is to be cleaned out of the stalls and campsites and then deposited in the manure spreaders located in the campgrounds, so be sure and bring a wheel barrow to make the job easier. There is a great roped off swimming area/beach (for humans only – no pets or horses) and plenty of fishing to be had as well! 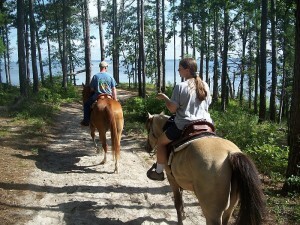 There is no lake access for horses at the campgrounds, but a few areas on the trails lead to the lake shores. There are no cabins to rent, but you may tent camp. There is also a nice shower/bathhouse right next to the Equestrian Camp which has four showers (one is handicapped), one men’s restroom, and one women’s restroom which has three stalls each. Cell Phone Service: I have AT&T service which worked most of the time outside of my trailer in the campgrounds but was spotty in some densely wooded areas on the trails. Pets: Dogs are allowed but need to be kept on a lease. Hunting: A frequent rider at the park did share with me that hunting is allowed during certain times of year and certain areas in the National Forest. She said she still rides when they are hunting but she is sure to wear an orange vest. So be sure to ask about hunting when coming to visit Ebenezer. 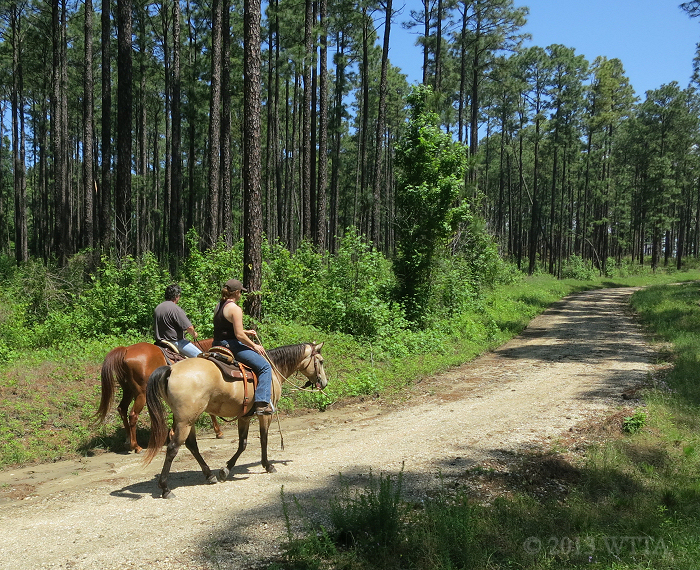 Driving: It is unknown if carriage driving is allowed at Ebenezer or the Angelina National Forest. However, there are several dirt and gravel roads which might work for driving but because of the gates (that a rider would just ride around) it seems like someone driving their horse would not get far. The trails in the dense forest are mostly one track trails as well. NETASA making their way through Angelina National Forest. Be ready for numerous log crossings,what fun! 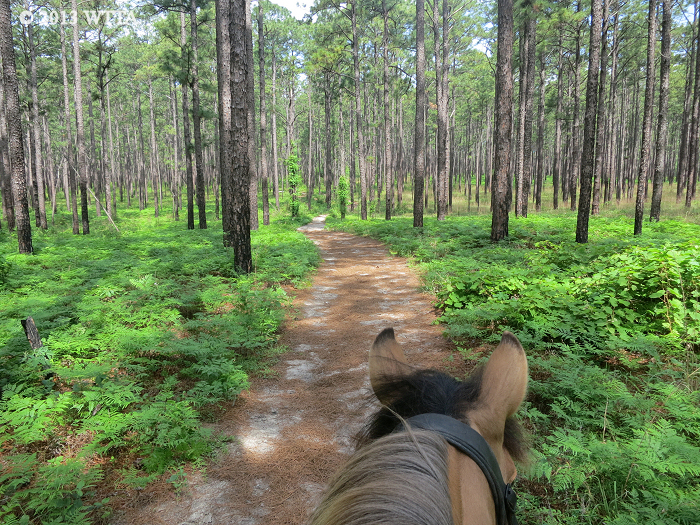 through the forest land with towering pine trees, all trails are shaded. Because of controlled burns done every so often the woods are beautiful and scenic with long range views and lake breezes through the trees unlike some forests where it’s just wall to wall thick brush. Ferns, moss and flowers will cover the forest floor, pine needles and sand muffle hoofbeats…it’s very peaceful. Some trails go deep into the woods, others will wind along cliffs that overlook the lake below and some go down on to the beach itself which is private, only able to access by the trails or by boat. Because of the sandy footing this lake is not boggy and has gradual packed sand entry into the water, excellent for safely swimming with your horse! Because of the shade and the lake access, it’s a great summertime place to ride. Due to the runoff/drainage topography into the lake this creates a nice hilly terrain and lots of creeks and gullies to cross through, so it is not boring and flat, but also not too challenging for beginner riders…a fun enjoyable ride! On some parts there will be “choices” such as a more challenging route up and out of a gully or over a fallen log…or you can take an easier route nearby that isn’t as steep a grade or that has no logs to jump, etc. There are some trails that will add some more challenge/difficulty though if you choose. These trails are wonderful for conditioning your horses. 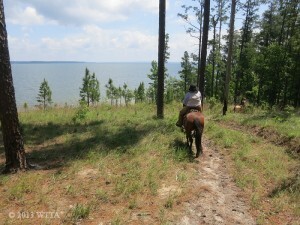 Riding along a cliff overlooking the lake. Photo given by Tiffany. Another nice thing is even after a rain the trails are open….I’ve never known them to shut down the trails. Because of the sand we’ve ridden there one afternoon after it rained that morning and mud wasn’t a problem at all. For those of you that have made plans to ride at other places just for them to shut down after an inch of rain and you have to cancel, you’ll appreciate a place that you know you can ride no matter what! The only drawback to this lovely park is that it does get crowded during summertime holiday weekends (Labor Day, 4th of July, etc. )…it is on a lake after all! But this mainly applies to the lake beaches as to what gets crowded…the Equestrian camp is separate from other camp areas and the horse trails will still be quiet though no one ever really goes on them other than horses (its too sandy for riding bikes really and I’ve never personally seen a hiker) so that’s not a problem and you can still enjoy this place on those weekends. But if you specifically want to ride on the beach or swim your horse– during holiday weekends you may not be able to even get down to the beach due to all the Boats that will anchor off the beach there and set up pop up canopies to hang out, have lunch, goof off, etc so it can get hectic there (and unfortunately the jerks will leave trash when they go, so please don’t judge the beach area after a holiday weekend, normally it’s pristine!) Anyway, most regular weekends are just fine though, and I personally love to go during the week…you often will have the entire park to yourself. As always clean Coggins is needed, reservations are highly recommended since only 13 sites are available, though you can go ride there for the day, don’t have to stay overnight or need reservations for that. For more information on the lake/reservoir itself http://www.swf-wc.usace.army.mil/samray/ Sam Rayburn Reservoir is the largest man made lake in Texas and is extremely popular for bass fishing. The much needed rain storms almost made Ebenezer a trip that was not to be. Despite the stormy outlook we stuck to our plans, except for departing a few hours late, politely allowing the storm to blow through first. Rain was the forecast for the majority of Mother’s Day Weekend. Fortunately, we were blessed with rain on Friday only, and Saturday and Sunday were spectacular! 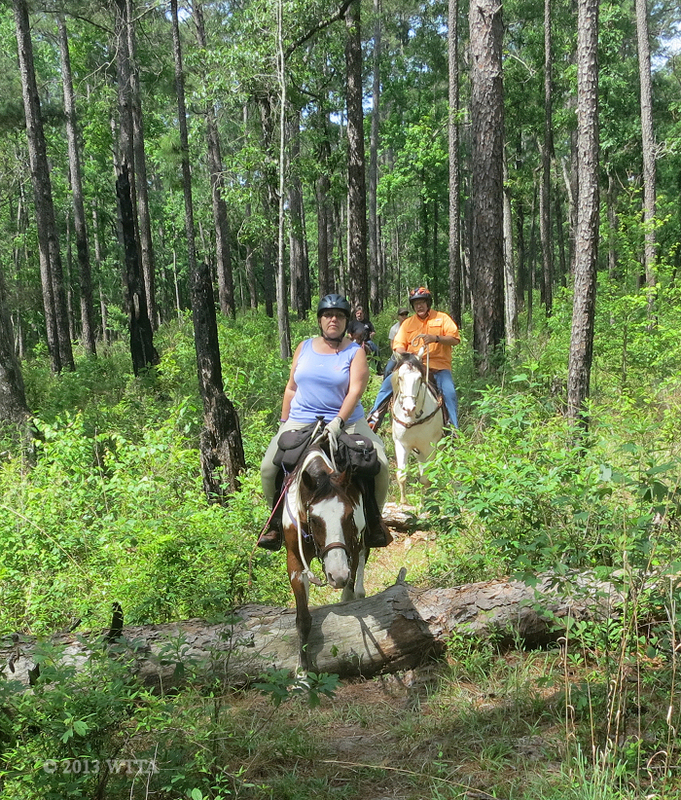 On this trip I had the pleasure to ride with NETASA (North East Texas And Surrounding Area), an American Indian Horse riding club, and one of my Where The Trails Are contributors, Ginger Podojil, along with her husband Paul, and their friends Linda and Russell Bland. We arrived at Ebenezer Park with just enough daylight to get settled in. Ebenezer Park, just northwest of Jasper in east Texas, rests off the banks of the Sam Rayburn Reservoir and opens up into miles of trails nestled in the thick piny Angelina National Forest. The forest is home to the endangered Red-cockaded Woodpecker who kindly made several appearances along the trail and campsite to my delight (a pair of binoculars is highly recommended for this trip). Ebenezer Park has 13 equestrian campsites, each fully loaded with two 12 x 24 paneled pens side by side, posts for tying, a pad for your trailer, electrical and water hookups, covered picnic tables, a grill/fire ring, and tall majestic pine trees for shade. Also within the campground is a bathroom/shower house. 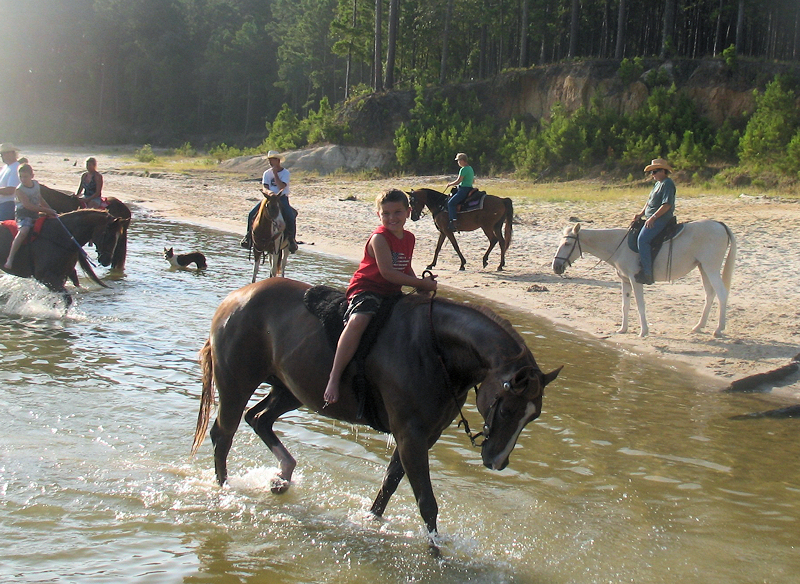 A swimming beach for humans only (no horses or pets) is just down the road from the campgrounds. 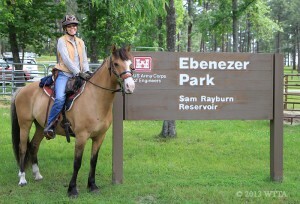 Due to the fine facilities and access to riding trails in a national forest, the equestrian campsites fill up fast; so reservations (made online at www.recreation.gov) are a must for Ebenezer. On our first trek, Ginger, who frequents this park, led the way and took us west, south, and then north eventually reaching the reservoir shores. Unfortunately there seemed to be less of a beach than I expected, but the view was awesome with waves rolling into the shore like an ocean. The horses were a bit unsure of the waves but soon overcame their hesitation to drink in the water, sights, and sounds. 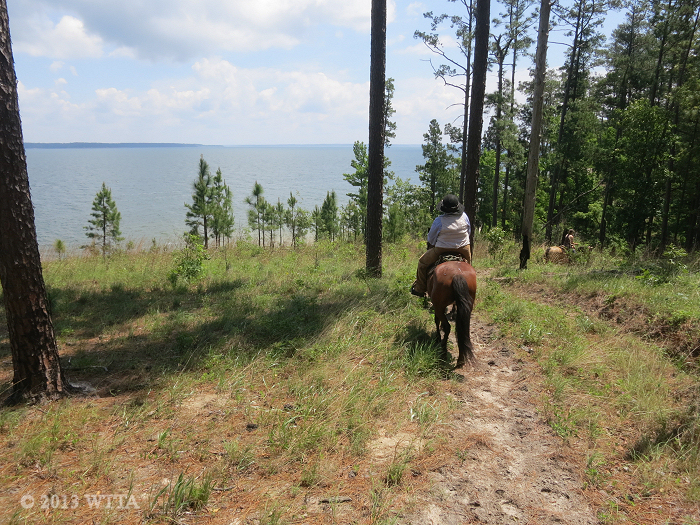 We rode east on the shoreline for a short time before heading back to the campgrounds. The shoreline was rocky, sandy, and had uneven slippery clay mounds in spots. That afternoon our second ride was mostly in the magical piny woods. For this central Texas hill country resident, the piny woods of east Texas, especially at Ebenezer park, are unreal, magical, and stately. I would not have been surprised to see a mystical creature such as a gnome or elf emerge from the shadows. Light filtering down through the trees played with the shadows and highlighted the thick green beds of vegetation. Of course the pine trees are prevalent but maples, oaks, and a few magnolias (among others) decorate the forest. Creek beds and water crossings were frequent along the trail. 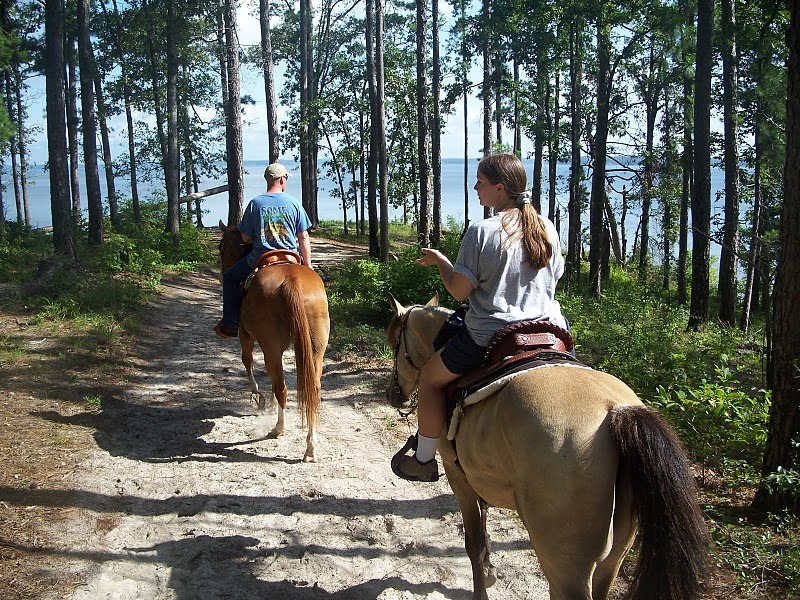 Although the trails mostly consist of sand and a few rocks, the horses must watch their step due to a great deal of deadfall, roots, and uneven surface. Log crossings are a trail obstacle your horse will excel in after a weekend at Ebenezer. 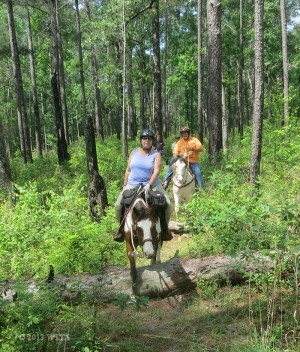 Needless to say the NETASA Indian Horse mustangs had no problems expertly maneuvering through the natural terrain. Creepy ride on our way to Dark Duck Lake. On Sunday morning Ginger’s friend Linda and her husband Russell took us on an adventurous eleven mile ride. Her goal was to show us what she calls the “Spooky Dark Duck Lake”. What a character Linda is, she has given almost all the trails at Ebenezer her own special names. We started out on a trail Linda calls “Fairy Tale Trail” which highlighted the forest’s magical beauty. Then she took us across Private Rd. 355 into gloomy burnt and ash-covered woods. The park rangers practice controlled burns in the forest to manage the environment. 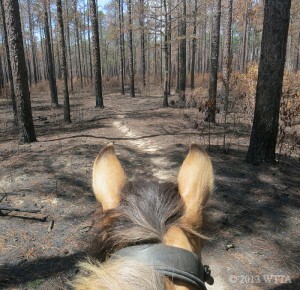 Riding through a burnt forest was a first for Angel and me. Although it was not beautiful the scenery was interesting and made for an unusual experience. It was amazing to see how quickly Mother Nature worked to repair herself as I looked at green plants peeking out of the ash covered ground. In addition to either loud booming machinery or gun shots going off from time to time, this indeed was a creepy ride for horse and rider. The lake reflected dark shadows from the trees, a few duck houses were perched in the waters, and Linda was sure we might get to see Sasquatch. In addition to the creepiness we got lost and had to follow a gravel road to get to a landmark. Luckily we hit a paved county road and got directions from my i-phone and a driver to get back on track. The trails are not well marked as far as names and signs go, but almost all of the trails will cross over a dirt or gravel roadway which will lead to a main road or landmark to get you back on track. I’m looking forward to exploring more of the Trails at Ebenezer, as this is a park I’ll want to visit again.